ssm Solution is in the Student Solutions Manual. Ilw Solution is available on the Interactive LeamingWare. IE. What must the separation be between a 5.2 kg particle and a 2.4 kg particle for their gravitational attraction to have a magnitude. 2£. Some believe that the positions of the planets at the time of birth influence the newborn. Others deride this belief and claim that the gravitational force exerted on a baby by the obstetrician is greater than that exerted by the planets. To check this claim calculate. 3E. 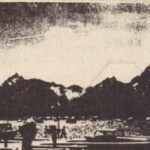 One of the Echo satellites consisted of an inflated spherical aluminum balloon 30 m in diameter and of mass 20 kg. 4E. The Sun and Earth each exert a gravitational force on the Moon. What is the ratio these two forces? (The average Sun- Moon distance is equal to the Sun-Earth distance. 5E. A mass M is split into two parts, m and M – m, which are then separated by a certain distance. What ratio m/M maximizes the magnitude of the gravitational force between the parts. 6E. A spaceship is on a straight-line path between Earth and its moon. At what distance from Earth is the net gravitational force on the spaceship zero? 7E. How far from Earth must a space probe be along a line toward the Sun so that the Sun’s gravitational pull on the probe balances Earth’s ? 8P. Three 5.0 kg spheres are located in the plane as shown in. What is the magnitude of the net gravitational force on the sphere at the origin due to the other two spheres? 9P. Four spheres form the comers of a square whose side is 2.0 cm long. What are the magnitude and direction of the net gravitational force from them on a central sphere with mass m5 = 250 kg? lOP.Two spheres of mass m and a third sphere of mass M form an equilateral triangle, and a fourth sphere of mass m4 is at the center of the triangle. The net gravitational force on that central sphere from the three other spheres is zero. lIP. The masses and coordinates of three spheres are as follows. 12P. Four uniform spheres, with masses mA = 400 kg, mB = 350 kg, me = 2000 kg, and mo = 500 kg, have (x, y) coordinates of (0,50 ern), (0, 0), (-80 cm, 0), and (40 em, 0), respectively. What is the net gravitational force on sphere B due to the other spheres? 13P. Shows a spherical hollow inside a lead sphere of radius R; the surface of the hollow passes through the center of the sphere and touches the right side of the sphere. The mass of the sphere before hollowing was M. .With what gravitational. 14E. You weigh 530 N at sidewalk level outside the World Trade Center in New York City. 15E. At what altitude above Earth’s surface would the gravitation acceleration? 16E. (a) What will an object weigh on the Moon’s surface if it weighs 100 N on Earth’s surface? (b) How many Earth radii must this same object be from the center of Earth if it is to weigh the same as it does on the Moon? 17P. The fastest possible rate of rotation of a planet is that for which the gravitational force on material at the equator just barely provides the centripetal force needed for the rotation. (Why?) (a) Show that the corresponding shortest period of rotation? 18P. One model for a certain planet has a core of radius and mass M surrounded by an outer shell of inner radius R, outer radius 2R. and mass 4M. If M = 4.1 X 1024 kg and R = 6.0 X 106 rn, what is the gravitational acceleration of a particle at points (a) R and (b) 3R from the center of the planet? 19P. A body is suspended from a spring scale in a ship sailing along ‘the equator with speed 1’. (a) Show that the scale reading will be very close to , where W is the angular speed of Earth and is the scale reading when the ship is at rest. 20P. The radius Rh and mass M” of a black hole are related, where C’ is the speed of light. 21P. Certain neutron stars (extremely dense stars) are believed to be rotating at about.If such a star has a radius , what must be its minimum. 22E. Two concentric shells of uniform density having masses M 1 and M2 are situated . Find the magnitude of the net gravitational. 23E.Density has a mass of 1.0 x 10′ kg and a radius of 1.0 m. What is the magnitude. 24P. A uniform solid sphere of radius R produces a gravitational acceleration. 25P.A cross section through the interior of Earth. Rather than being uniform throughout, Earth is divided into three zone. 26E. (a) What is the gravitational potential energy of the two particle system in Exercise . 27E. (a) In Problem 12, remove sphere A and calculate the gravitational potential energy of the remaining three-particle system. 28E. In Problem 5. what ratio m/M gives the least gravitational potential energy for the system? 29E. The mean diameters of Mars and Earth are 6.9 x 10·’ km and 1.3 X 10′ krn, respectively. The mass of Mars is 0.11 times Earth’s mass. 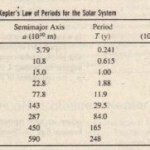 (a) What is the ratio of the mean density of Mars to that of Earth? (b) What is the value of the gravitational acceleration on Mars? (c) What is the escape speed on Mars? 30E. Calculate the amount of energy required to escape from (a) Earth’s moon and (b) Jupiter relative to that required to escape from Earth?